Approved! published on 26. Februar 2018 Read more posts by the author of Approved!, CaroKeine Kommentare zu Approved! For three years we’ve been working to bring you a new episode of Tales from the Couch every Monday. It was a lot of fun and enriched our lives, but we can not maintain that rhythm. Factors in our non-comic life are currently requiring our attention and time, and as a result, TftC has recently felt less like a passion project and more like a stressful, very badly paid second job. We therefore decided to make some changes. This is what the future will look like: Timo will continue to make comics for Tales from the Couch, but much more irregular and probably in a different style. There will not be a new update every Monday, the comics will appear if I think of something good and I have time to produce them. Follow Tales from the Couch on Twitter or Facebook to find out when a new comic comes out. Caro has a lot of new, exciting projects on the horizon, you can learn more about them here, as soon as we can tell you more. Stay tuned! We will be back at a few comic conventions this year, including the Comic Salon Erlangen (Wohow! ), Where you can meet us in person and of course purchase print editions from TftC. More information regarding conventions will be posted in our social media and here on the site. That’s it for the moment. I hope to see you again soon! The MCM Hannover! published on 27. Mai 2017 Read more posts by the author of The MCM Hannover!, TimoKeine Kommentare zu The MCM Hannover! So last week we visited the MCM Hanover. In 2016 the MCM became our first con ever, and it’s nice to come back again and compare to what we have learned since: firstly, we now have a nicer, fireproof blanket for our stuff and secondly, that’s it. Like the last time we had a lot of fun, met a bunch of cool people and also met some old friends again. Many, many thanks to all who came by! It was a great time meeting you, talking nerdy stuff and watch the cosplayers. Not pictured (because timos camera phone needs thirty seconds of complete silence and a magnesium flare to produce images) but also there were: Christoph from Gucknichtso.de, Adroth from Karrakula.de, our frenemies from Nigunegu.de, and many, many more. Last week we made the first, cautious step back into the open – at a comic con! It’s always a shock to leave your cave/apartment after a long, cold winter, but these are the things we do for comics… We’re visiting 3 cities in Germany this year. The first one was the Comic Invasion in Berlin last week, next weekend we’ll be at the MCM Comic Con Hannover and the Comic Con Germany in Stuttgart in July. Besides lots of Couch-Comics Timo also sold all of his own older comics that he had left. Huzzah! We need to pass this week – which has nothign to do with the annual Birthday Carooke Party in Berlin. BUT! We can already announce where you might meet us this year! If you want one of the notorious „Robby Poledancing“ scribbles, Timo’s „Business Man“ comic or our printed comic, you can find us on the following cons. The Comic Invasion Berlin on the 6.5./7.5. the Comic Con Stuttgart on the 1.7./2.7. We also plan to visit the Hannover Comic Con, since it’s in Timo’s area. As you might have noticed we don’t post that much during the week – but that has a reason! Besides jobs, hobbies, meeting other human beings and all that crap we(which means mostly Caro, but Timo slowly descends into this madness, too) started working on a mobile game! Escape from Innsmouth(working title which will very like change soon) is a Choose your own Adventure game. You might remember COYA books, in a time before machines took over control of our lives. It’s going to be playable in English and German for Android&iOs and I’m building it in Unity. As you begin to play the game the story takes you to the coastal town of Innsmouth, where you are supposed to find a missing girl. Sooner or later you will realize that something’s fishy about Innsmouth (I’m really sorry, but I just had to write that). Just expect LOTS OF TEXT! So that’s why we don’t post that much, we’re busy! Yo ucan do us a big favour and spread the word! Happy Holidays! published on 26. Dezember 2016 Read more posts by the author of Happy Holidays!, CaroKeine Kommentare zu Happy Holidays! We’re out until the new year, we’re off visiting families&friends. And watch out, there’s this deranged serial killer named 2016 still running around out there. See you again in 2017! Inktober! published on 7. Oktober 2016 Read more posts by the author of Inktober!, CaroKeine Kommentare zu Inktober! Our Facebook followers know this already: Inktober has started! 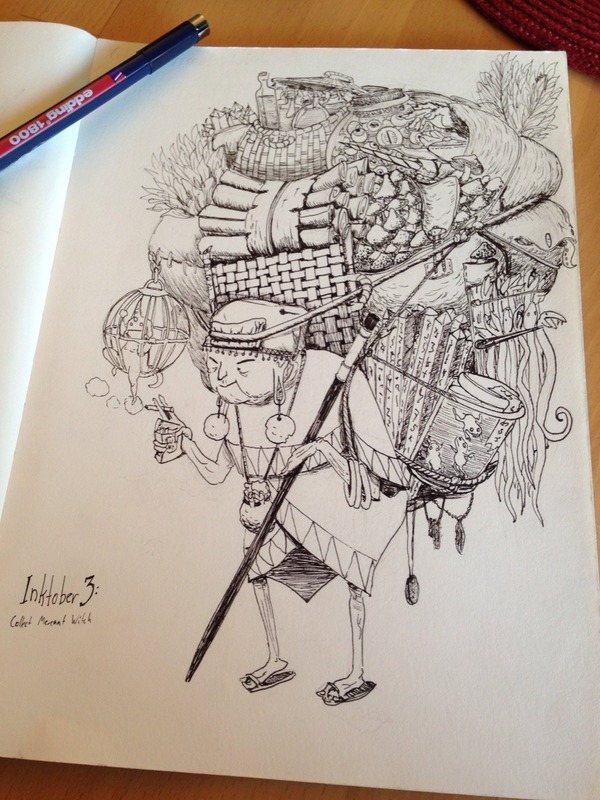 Motivated artists ink a picture every day and share it on social media channels. This year, Timo&me were finally willing to join in! It’s only the 7th now but we’re on a good track. We’ll post a Mini-Overview in the end, until then you can see our efforts on tumble/twitter/instagram, see the links at the top right. If some of you participate, tell us! Its happening: ComicCon Germany opens its doors this saturday, and we are there! Come and see us at table 156.